Oak is the biggest trend in American Craft Brewing, everyone from Allagash to Russian River to your local brew pub is throwing something in a wine or bourbon barrel. There is no reason that you can't get the same caliber results as home with just a the right oak, some planning and some time. The jar in the picture contains Makers Mark Bourbon and 2 oz of Heavy-Toast American oak cubes most of which that are going into a Scandinavian Imperial Porter (Munich malt, plenty of roasted, specialty, and cara malts along with licorice root, heather honey and cardamom). I’ve used oak beans/cubes both soaked in wine or liquor and plain. To me both soaked and not they give similar results (I think time, wood origin, toast level and ratio of oak to beer are much bigger factors), either way I boil them for a few minutes first to sanitize and leach out some of the tannins. American oak is stronger than Hungarian which is stronger than French. The darker the oak is, the stronger the contribution to the finished beer will be (time, and ratios kept the same) will be. I have heard nothing but bad things about the easier to find oak chips (shavings). They have so much surface area that their flavor gets infused within a week or so, which prevents you from tasting the beer and transferring it before the oak gets too intense. I have seen other products such as oak spirals and oak strips which look like good ideas, but I have not tried either yet because the cubes are so easy to use.If you soak the oak in a spirit or wine for a short period of time all you are doing is causing the oak to absorb a small amount of the liquor which will them be carried into your beer. I doubt you are doing much damage to the cellular structure of the wood in a few weeks as some people suggest, particularly when most wineries reuse their barrels multiple times before they get rid of them and almost all brewers prefer second hand barrels because of their mellower character. All that being said, if you are looking for a spirit/wine character in your beer you would be better of blending it directly into your beer. Doing this is actually illegal for most commercial brewers, so I look at the barrel thing as really just an end-around the long arm of the ATF. I do think you can get a hint of flavor and mellow the oak character slightly by soaking it in another liquor before adding it to the beer, but I've never done a test to see if this is really any better than just adding the oak and a little of the other liquor directly to the beer. Certain beers, particularly those with Brett like La Folie or the tremendous barrel aged beers from Russian River (Temptation, Beatification, Supplication), benefit from the slow transfer of oxygen through the wood. However, there are risks involved as acetobacteria also loves using oxygen to turn your alcohol into vinegar. So oak cubes are more appropriate for beers that you just want oak flavor in (although Brett can metabolize some of the caramelized wood sugars, so it isn't useless if you don't have the effort for a more complex system). A few weeks back (while brewing a Scotch ale with a few buddies that is now sitting on medium-toast French oak beans that were soaked in Cognac) I broke out a bomber of a straight forward English Barleywine (Just Maris Otter, EKG and Windsor yeast that my buddy Jason and I brewed) that had sat on 2 oz (for a 3 gallon batch) of medium-toast French oak for 2 months. At bottling a year ago the beer was rather harsh, with a strong tannic quality. The beer has mellowed nicely since then, and while the oak is still a strong component it now contributes pleasant notes of vanilla, caramel and toast. Several of the homebrewers I shared the bottle with swore that there was a little bourbon or whiskey in there. How well this beer came around has caused me to reconsider how much time/oak I will be adding to beers in the future. I recently bottled a couple of beers that had been aging on smaller amounts of oak (.5 oz of wine soaked oak in an Old Ale with Brett C and .25 oz bourbon soaked oak in both secondary and tertiary in a Cherry Belgian Dark Strong with Brett C and Orval dregs) for around 9 months. These beers both ended up with a moderate oak quality that seamlessly blended into the beer. It is hard to tell exactly what qualities come from the oak and what comes from the beer itself (I don't pick up much of the liquor in either one). I think the larger quantity for a shorter time gives you a character which is more identifiable as oak, but that tastes more layered on than integrated. I have a 3 gallons of Russian Imperial Stout aging now on ¾ oz of oak for a few months, I hope this combination of time and amount will give an oak character which is both distinct and integrated into the beer. Do you agitate your fermenters from time to time when oaking the beers or just let them sit? I just let them sit while they are aging. In general agitation isn't supposed to be great for aging beer. When you boil your cubes to sanitize, do you also add the water that you boiled with? Or do you just add the cubes? Also, If you want to use liquor, do you boil the cubes before you add them to the Liquor? I toss out the water, part of my goal with boiling the oak (in addition to sanitizing) is to remove some of the fresh "lumber" flavor. If you wanted to add the oaky water I would start with les oak. Sometimes I boil pre-soaking sometimes I don't. I will if I'm not going to soak the cubes in much liquor/wine, but I often won't if I'm using say ½ cup per ounce of cubes or more. The soak length also matters the longer I am planning to soak the cubes the less likely I am to pre-boil them. This post a few years old, I’ll have to revisit this topic. My homebrew club brewed several batches of the same high gravity Baltic Porter recipe and put it into a 53 gallon oak bourbon barrel to age for several months. It is nearly time to split the beer up, and we are now concerned about possible stratafication, but we don't want to stir it and dredge up all of the sediment that will have settled by now. Will the beer be the same throughout, or will it be stratified with the lighter alcohol on top and the heavier beer at the bottom? A few people in our barrel group have suggested that there is some bottle to bottle variation in the amount of oak, but I haven't noticed it. Maybe try pulling some samples from different points in the barrel to see if you notice any differences. The book will certainly have a big section on using oak (both barrels and alternatives), some version of that may make it to the blog eventually. I was thinking about using some of the oak chips I have for smoking food (though their provenance is uncertain), then I thought - what about the other woods? Cherry, birch, apple, plum, etc. Does anyone use those? I know few wines use anything other than oak, very occasionally chestnut. I've had a number of commercial beers aged on other woods like cherry, maple, palo santo etc. certainly lots of potential there. Smoking woods are good because you know they are food grade, but you may want to toast them first to remove some of their raw flavor. Playing with times, amounts, toast are all going to be key. I've been planning an experiment of some sort, but I haven't gotten around to even procuring the woods. If you try it, let me know how it works! So what are your thoughts about when to oak? Should you throw in cubes when you rack to secondary? 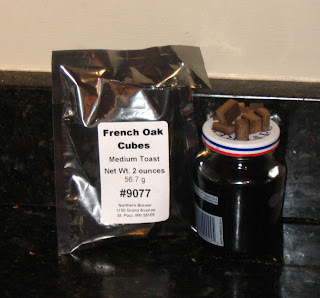 Or if I am going to age for several months on oak, should I rack beer from secondary onto oak cubes in a "tertiary" to separate it from the yeast in secondary? I see no reason to wait to add the oak. However you may want to remove it before the beer is ready to bottle. The dark saison I added a wine stave to a month ago is already oaky enough for my tastes, but the beer still needs a few months to age. I'm wondering if you have any advice about using un-used oak barrels. I made myself a barrel a few years back as a school project, but I haven't used it yet. I haven't been able to find much information on techniques of sanitizing an oak barrel. I haven't toasted it yet, nor is it closed. Still have some work to do, but I would appreciate any advice you may have. Thanks in advance. And thanks for the great blog. Really cool that you made your own barrel! We've always bought well used oak barrels, specifically so we wouldn't have to deal with all of that fresh oak character. Having a smaller barrel makes the problems even worse since the smaller the volume is the higher the surface to volume ratio will be. At a minimum I would do a couple changes of hot water to get a lot of the oak flavor out. This will also let you know if the barrel is watertight. Charring it plus using really hot (190 F or hotter) water for the soak should get it pretty safe. Sulfite citric acid solution, or burning a sulfur wick are your other options. The first beer in should be something pretty bold, and that doesn't need to be in the barrel too long (barleywine, imperial stout). If you want to do sours after a batch or two, you may want to age them in the barrel for only a couple months before moving to an impermeable fermentor like a carboy. Mike, Thanks for the quick response. I appreciate your care for the craft. I'm still a little confused about the process. I was surprised that you suggested using the barrel as a primary. I would have thought that the barrel makes sanitization difficult. I guess when you use oak as an addition you can sanitize with alcohol. But, when using a barrel the issue of sanitizing is inverted...perhaps. Are you suggesting that the hot water is added immediately before the addition of the wort? Therefore the barrel is sanitized by heat? My thought that was you would use the barrel as a secondary, after the wort has created enough alcohol to tolerate a potentially hazardous environment such as the oak barrel. And it seems that after having clarified the beer in the primary you may have a little less gunk to deal with in the barrel. I must say that my reasoning is all biased by the desire to tap the barrel as if it were a cask ale...and I only recently realized that cask ale doesn't mean that your getting a pint of beer from an oak barrel. Ha. I'm a romantic I guess. Thanks again for you help. If I implied using it as the primary fermentor, that wasn't my intent. You can primary in a barrel (lambics are), but it is a real pain to deal with. Fermented beer is certainly safer due to the low pH and alcohol, but it is not invincible. I would have the hot water in the water until right before you fill the barrel with fermented beer. You could add a pint of liquor and roll around the barrel if you want an addition character, but I don't think it is necessary. Make sure you have enough beer to fill the barrel completely. Certainly not traditional, and I'd worry about adding much carbonation, but serving out of it would be a lot of fun. I know Raccoon Lodge does this with some of their sour beers. I have recently acquired some wine barrel staves and will incorporate a cut piece or two in primary and secondary of a stout I am planning. They are a light to medium toast pinot noir staves. Any recommendation about what size or weight of piece(s) to use or just go for a few ounces and try it? A fellow homebrewer shipped me a couple similar staves, and I added about 1.75 oz of one directly to a black saison. It turned out this was too much, within a month the beer was already getting too oaky/tannic for my tastes. Granted a dry saison can’t take as much as a big sweet stout or barleywine, but I think 1 oz would be a safer place to start. You could boil the oak first to soften the flavor, but that would also remove any wine character that remained. Enjoy. In the next few days I will be brewing a barleywine along the lines of Firestone Walker's Sucaba (Formerly Abacus)which will require somewhere near a year of sitting on oak cubes soaked in various liquors to try to simulate the barrel aging that occurs there. As I was trying to dial in the SRM to the 36 that Sucuba is listed as, I realized that the oak would most likely also contribute a good amount of color. Do you have any suggestions for how much lower the SRM of the beer should be pre-oak in order to get in the ballpark of 36 after aging? I had Sucaba for the first time over the weekend, what a great beer. One of the secrets of the Firestone Walker barrel aging program, apparently, is that they keep their barrel temperature controlled (under 50 F if I recall correctly). I don’t think oak adds much color, certainly no more than 1 SRM. I think that oxidation would play at least as great a role. Think how pale well aged lambics still are. From looking at it I didn’t think that Sucaba was 36 SRM (which is close to black),m I would have guessed it was more mid-20s. It is great that they are one of the breweries that lists all of the malts/hops used on their website. Firstly, just wanted to commend you for always responding to comments in a timely manner, its definitely not necessary on your part but is very appreciated. I was in Paso Robles last weekend, and had the pleasure of trying Sucaba for the first time in Firestone's taproom. I was blown away, definitely one of the best barleywines I have ever had. 36 seemed a little high to me also, glad you feel the same. Roughly 38 ibus worth of Bravo at 90, and 4 ibus worth of EKG at 15. Any suggestions? I'm at 23.5 srm at the moment, but am a little worried about adding too many unfermentables by upping the crystal. I might replace the 20L with 40 or 60 to get the SRM in the mid to upper twenties. Let me know if you have any ideas to add to this beast! Sounds about right to me. Not far off of the barley wine I did inspired by Angel's Share. I was planning on mashing at 149, even though I'm beginning to doubt some of what is written on the bottle of the Firestone reserve series, the listed FG of Sucaba is 4.7 P, quite a feat for 002! Can't wait to get this one going, waiting a year is going to be hard. Now if only I could find a recipe for Parabola, probably my favorite beer that they make! Agreed. In some ways I am often underwhelmed by their anniversary blends, considering just how great the component beers that I have tried have been. I have heard the brewer say that he thinks Briess Roasted Barley is one of the keys to his dark beers. It is only ~300L, much lower than other versions. Sadly I think without actual barrels you are going to have a hard time mimicking the flavors they get. I have had good luck with cubes, soaking/dosing liquor, but it just doesn’t match what we’ve gotten from actual bourbon barrels (and those have been from a cheap producer). I've always been pretty confused about that as well. He usually even has vintners assisting him with the blending, and you would think those guys would know a thing or two about how different flavors meld together. I'm already resigned to the fact that I wont be creating a perfect replica of sucaba, but if I get even close that beer won't be sticking around too long! I was wondering what you thought about the imperial stout with the 3/4 oz of oak for a few months? Getting ready to do a large imperial stout og 30 plato. I was thinking splitting the batch and aging half on an oz oak and rum. Hi Mike, thank you for both this blog and your book. They are a wonderful source of information! These are chunks of actually used whiskey barrels. I've bought them and the aroma is fantastic! I'd like to use them to age my Brett Trois sour ale on (which I brewed a few weeks ago) for at least 6 months. Now my dilemma is: should I boil these before adding them (and possibly kill the wonderful aroma they have) or add them straight from the package? Mike, I've been getting my feet wet with a couple of 5 gal. glass carboy soleras. I have a Flanders red in one, and a lambic in the other. I've been planning to rack three gallons or so each year onto fruit for additional aging. Would I gain anything by adding oak cubes to the carboy solera itself? Oak flavor, tannins etc. I like less oak for longer and more fruit for shorter. Hi Mike! 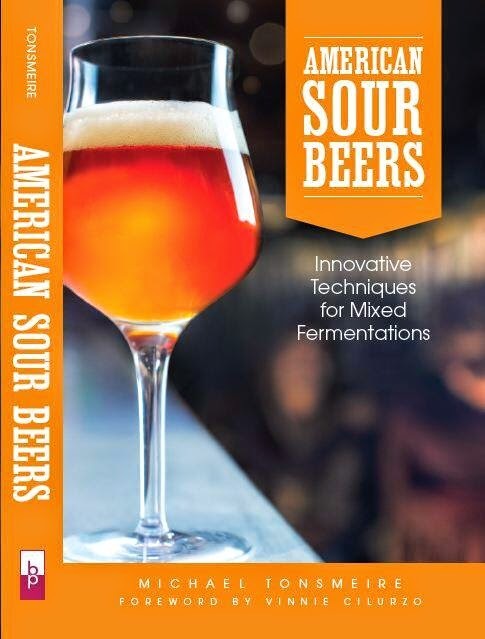 Just wanted to clarify the weight measurements given in (the amazing) American Sour Beers, are they given as dry weights of oak cubes or wet/soaked? If the cubes are soaked, I'm weighing them right before adding to the beer (saturate with spirits) because I used to keep jars of them ready to go. If the oak is being steamed or boiled it is usually dry weight before steaming. Sort of the difference between "one cup of spinach, chopped" and "one cup of chopped spinach."